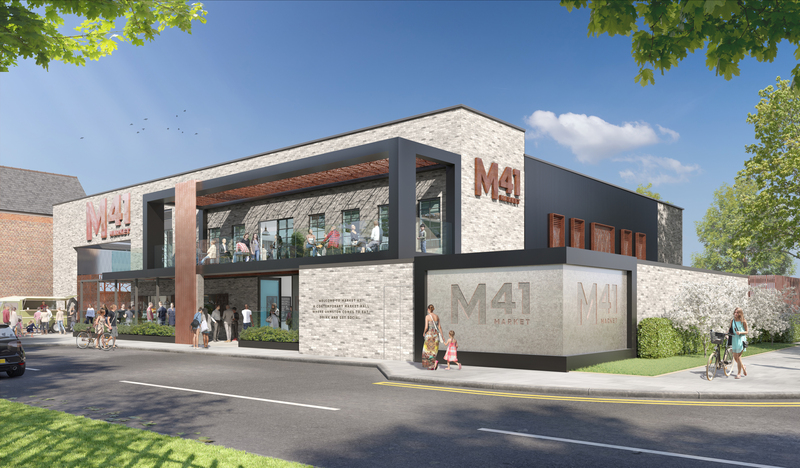 Trafford Metropolitan Borough Council has given the green light to Market 41, giving the McGoff Group planning consent to build its bespoke new build food market hall in Urmston. While the trend for food market halls opening across the UK is nothing new, Market 41 will be the UK’s first privately owned, new build food market hall. Not only a first for the UK, Market 41 is also a first for Altrincham-based McGoff Group, who have acquired the land, designed the scheme, managed the planning process and will now also construct the building, starting on site in January 2019. Located strategically on Railway Road in Urmston, in the heart of the town centre directly opposite the train station, Market 41 will follow the underlying food market hall trend, providing “diverse freshly-prepared authentic food and drink, enjoyed communally!” as quoted by Cushman & Wakefield in its Food Halls of Europe report (2017/18 edition). Within Market 41 there will be 10-12 food and drink operators positioned around a central, casual communal seating area. There will also be a mezzanine level, private dining and outdoor seating, with the ability to cater for 160-180 covers. To date, the McGoff Group has already received interest from approximately 50 potential operators from across the North West, including artisan and independents as well as small restaurant owners who are, more often than not, using markets as a platform to showcase their offering to fuel expansion. With planning permission now confirmed, this number looks set to triple in the coming weeks. Chris McGoff, Director at the McGoff Group, says: “It is fantastic news that we have received planning consent for Market 41. It has been a long time coming and we know that excitement and anticipation has been mounting in Urmston and the surrounding areas for many months. To be able to confirm that Market 41 will open for business in 2019 feels great! The McGoff Group has been working with Northern food commentator Thom Hetherington, who has already used his extensive experience and network of contacts within the ‘Northern food scene’ to suggest how the mix of operators in Market 41 will work. He has also held workshops with aspirational Urmston residents and is looking forward to shortlisting candidates through a comprehensive tasting selection process! Chris continues: “We strategically choose Urmston for Market 41 as the town already has a vibrant and flourishing independent and artisan food and drink scene. Market 41 will simply enhance this further. We have taken time with the design of the building, its layout, the interior décor as well as the outdoor space to create a superb, stylish, flexible, family-friendly food market hall with space for pop-up stalls and both private and community events. Operating partners for Market 41 will be carefully selected to ensure that local customers benefit from the very best quality and choice at competitive price points. There will be a strong focus on independents from across the region who can bring fresh, locally-sourced artisan-quality food and drink to the food hall, offering something different for the local community and attracting revenue from outside of Urmston. For further information regarding Market 41, or for an Operator Application Pack, please contact Kay Johnson at the McGoff Group on 07972 732477 or email kay.johnson@mcgoffgroup.com. Alternatively, visit www.market41.com.